Irvine, Calif. – Las Vegas-based graphics company, Identity Brand, has teamed up with Wayde King and Brett Raymer, owners of Acrylic Tank Manufacturing (ATM) and hosts of the popular Animal Planet series “Tanked,” to create a one-of-a-kind wrapped vehicle with a fully functional 800-gallon saltwater fish tank custom-fitted within the rear seat and cargo area. The unique “SUV-aquarium,” created for Toyota, was featured on a recent (March 7) “Tanked” episode. According to Phillip Dominguez, owner of Identity Brand, the vehicle was transformed into a Bikini Bottom-themed mecca inspired by Nickelodeon’s hit animated TV series SpongeBob SquarePants. 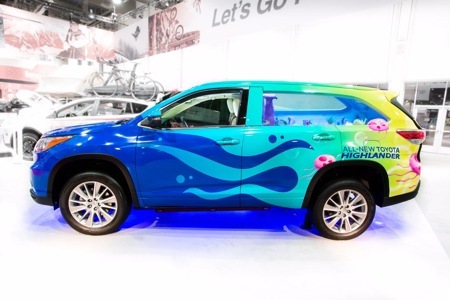 Showcasing Toyota’s new 2014 Highlander model, it was displayed at a number of major automotive specialty events held in late 2013, including SEMA in Las Vegas and the Los Angeles Auto Show. “This was a challenging project that involved working with three prominent companies from different industries – Toyota, Nickelodeon and ATM,” said Dominguez. Identity’s crew needed to wait until Wayde and Brett were finished with the tank installation before starting work on the custom vehicle wrap. They didn’t have to wait long, however. 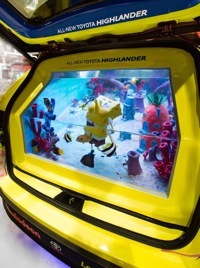 “The guys were able to turn the Highlander’s entire hatchback space into a larger-than-life SpongeBob SquarePants-themed saltwater tank within a matter of hours,” noted Dominguez. A complex filtration system, including an overflow system, sterilizer, UV filter and temperature regulator, was also built into the vehicle. Upon completion of both the aquarium install and the vehicle wrap, ATM filled the tank with approximately 115 individual fish (32 different species), including starfish, squirrelfish, Fiji Foxface, flame angel, clownfish and pilotfish. “Thanks to the efforts of our skilled group of professionals and the capabilities and reliability of our specialized equipment, the result was an outstanding finished product and an extremely happy group of clients,” noted Dominguez. To learn more about the advanced 64-inch Roland VersaCAMM large-format printer used to produce this vehicle wrap, or the complete lineup of high quality Roland digital printing equipment, visit www.rolanddga.com.